3 Legged Bear Walking Upright! 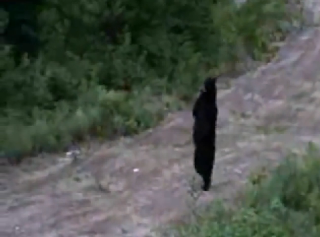 Watch how smoothly and easily the bear walks on two legs. The bear may have been born with only 3 legs but mostly likely lost it in a trap. I could see how this could be mistaken for a Bigfoot. "I don't know anything about this video, such as where it was taken, as it was E-mailed to me, but it pretty much speakes for itself. A three legged bear with cub adapting."